Bus from Johor Bahru to Jerteh plays major role in connecting travellers from Southern Malaysia and Singaporean to Perhentian Island. Jertah (Jertih) is 20 minutes driving distance away from Kuala Besut, the nearest gateway to Perhentian Island. Passengers arriving at Jerteh bus terminal can take a taxi to Kuala Besut Jetty for the ferry service to Perhentian Island. Perdana Express is the only bus operator serving bus from Johor Bahru to Jerteh. They offer 1 daily service at 8.45pm only. Due to the limited daily service, passengers are advised to book ticket earlier to avoid disappointment. Perdana Express&apos;s Coach fleet deployed for this service route is double deck VIP coach. The conditioning VIP coach has upper deck seats and lower deck seats. The seat layout are arranged in 1 seat on the left and 2 seats on the right. The spacious seat layout ensures passengers having comfortable experience with Perdana Express in this long-distance journey. The departure point for bus going to Jerteh in Johor Bahru is at Johor Bahru Larkin Bus Terminal. Passengers can easily get to Johor Bahru Larkin Bus Terminal, the main and largest bus terminal in Johor Bahru by bus or taxi. The arrival point in Jerteh is at Jerteh Bus Terminal. Passengers can easily ride on a taxi to Kuala Besut Jetty for the ferry service to Perhentian Island. The bus fare for bus from Johor Bahru to Jerteh is reasonably priced at RM 65.00. 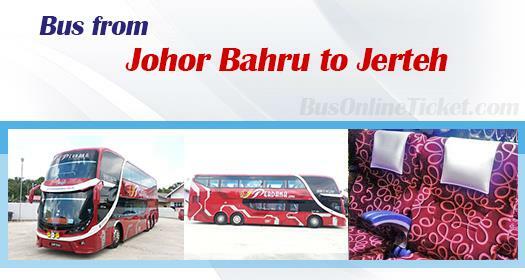 Duration required for bus from Johor Bahru to Jerteh takes about 8 hours depending on traffic condition. At least 1 stopover will be provided during the journey. Passengers are advised to book their bus ticket online at BusOnlineTicket.com in advance due to limited trip daily. You can simply book ticket online in advance at BusOnlineTicket.com to secure your seat and avoid long waiting time at the counter.